Selling my beautiful Maggie Soterro/Rebecca Ingram Yvonne Dress. This one of a kind dress has a sweet heart bodice made of delicate lace fitting any bride perfectly with its hidden corset. 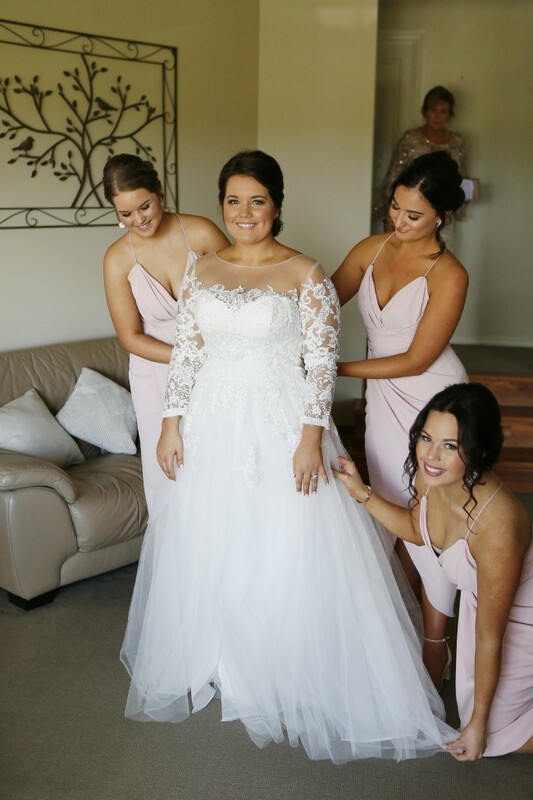 Adding to the dress' elegance is the beautiful skirt made from tulle sweeping into a beautiful train perfect for photos and that 'wow' factor for all to see when walking down that aisle. Underneath the tulle is organza and satin that perfectly complimenting the brides curves. The front of the skirt is made with a subtle split allowing the bride to turn this dress from the one she marries her best friend in to the dress she celebrates in. This dress is elegance, class and sophistication all in one. This dress is a size 14 but would fit a size 12-16. This dress was very comfortable on the day to wear and was very functional. This dress has been altered to include a bustle. Please note that photo's show the lace jacket. This is not for sale but I have the contact details from the seamstress that made it for me at an affordable price. This dress was dry cleaned all fake tan has been removed and there are no tares or rips to the ends of the dress. I am located on the lower North Shore of Sydney but am also on the central coast. Please get in contact if interested!